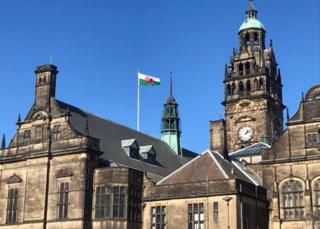 Sheffield City Council has been forced to apologise after it mistakenly flew a Welsh flag on St Patrick's Day. The red dragon emblem was spotted fluttering above Sheffield Town Hall on Sunday instead of Ireland's green, white and orange tricolour. A council spokesperson said a "basic error" was to blame and apologised for any offence caused. The authority said it would be raising the issue with staff and the company responsible. The blunder came less than 24 hours after Wales beat Ireland 25-7 to claim the Six Nations rugby title. Sheffield City Council said: "While we're at it, we would like to congratulate Wales on their fantastic victory in the Six Nations at the weekend and wish everyone a Happy St Patrick's Day, too." Chrissy Meleady, of the Irish People's Forum in Sheffield, said older members of the community were "particularly aggrieved", adding: "It's a little bit sad that they couldn't differentiate between the flags." She described the reference to Ireland's loss in Cardiff as "quite an insult" and a "secondary slap". "We've had Irish people here since 1455 and we've made major contributions to this city down the generations," she said. "Even this town hall, all of the flag work, all of the artistic work, the carvings were done by Irish artisans." The council has subsequently issued a second statement apologising for "any offence" caused by its initial comments. The error also left social media users scratching their heads. Saint Patrick is the patron saint of Ireland. He lived in the 5th century AD and is understood to have played a major part in converting the Irish to Christianity. While St Patrick really existed, and some of his writings survive, his value does not really come from historical details but from the inspiration of a man who returned to the country where he had been a child slave, in order to bring the message of Christ. He is traditionally associated with the shamrock plant, which he used to explain the Christian doctrine of the Holy Trinity.